If you are looking for a last minute recipe for Thanksgiving day check out these recipes from Green Rush Daily. 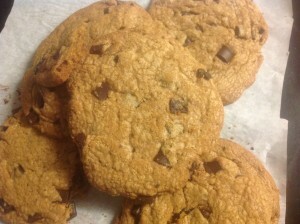 If you are looking for dessert ideas check out our go-to chocolate chip cookie recipe. This is one of the simplest recipes that makes some fantastic cookies that cook quick but harden well around the edges. Be warned the cookie dough is also great to eat too so keep the little (or big) cookie dough eaters away from this one. You can make these a few days in advance if desired and store them in air tight containers. Enjoy. Melt your pre-made cannabutter in a medium bowl in microwave.